UPDATE, 10/31/2018, 7 p.m.: One day after an announcement that his job had been spared, DJ Durkin is out as the head football coach of the Maryland Terrapins. University President Wallace Loh announced Durkin’s departure in a statement Wednesday night. WASHINGTON — The University of Maryland’s head football coach will be back on the sidelines when the Terrapins play Michigan State on Saturday. Both DJ Durkin and Athletic Director Damon Evans will return to their positions following weeks of inquiries into the death of Terrapins offensive lineman Jordan McNair. 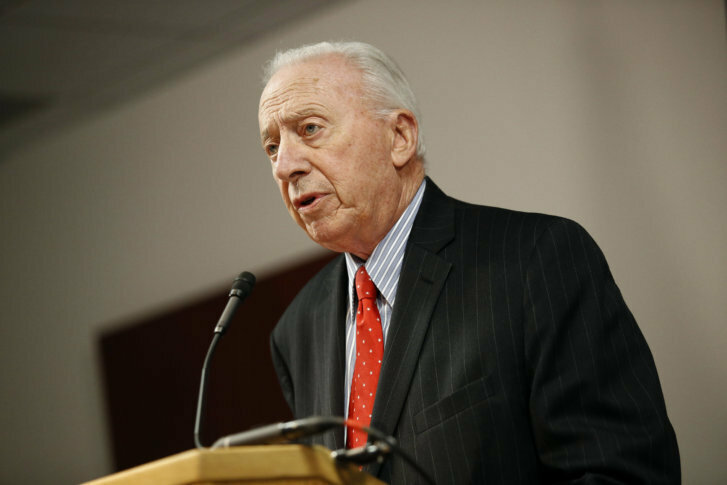 The university Board of Regents’ recommendations were detailed during a news conference Tuesday afternoon, the latest chapter in a saga that began with McNair’s death on June 13. The 19-year-old had collapsed after a preseason conditioning drill two weeks earlier, on May 29. The reported cause of death was heatstroke. Trainers on the scene May 29 did not follow proper procedures after he collapsed on the field, according to an independent investigation into the student-athlete’s death last month. Jim Brady, Board of Regents chair, told reporters Tuesday that Durkin is a good man and a good coach at the beginning of his coaching career. Maryland’s athletic department lacked a culture of accountability and failed to provide adequate oversight of the football program. University leadership bears some responsibility for ongoing dysfunction in the athletics department. An independent monitoring group will soon be formed, he said, to ensure compliance with those recommendations. University of Maryland System Board of Regents met via private conference call Monday to discuss the futures of Durkin, Evans and Loh. It was their fifth meeting in 11 days. On Friday, the board had face-to-face meetings with Loh, Durkin and Evans and gave itself a Tuesday deadline “to announce any initial decisions and/or recommendations from the board.” Durkin, who had been on administrative leave since August, had made a positive impression with the board when they met Friday, a source told WTOP. “All three individuals understand and have accepted that they share responsibility for the dysfunction within the athletic department,” Brady said Tuesday. “But [the board] also found that all three individuals share our commitment to improving the culture in the university’s football program and to implementing the recommendations” of the reports on McNair’s death and on the football program itself. “He is, in my judgment, one of the finest athletic directors in this country,” Loh said. Loh said he accepts responsibility for the “ongoing dysfunction of the Athletics Department” that the independent commission’s report found in their report. In a letter sent to the university community Tuesday night, Evans said he was “personally grateful” for Loh’s leadership and that Loh had “transformed the University of Maryland” as president. Evans went on to outline upcoming changes to the athletics department and the football program, such as providing more chances for students-athletes to share their concerns. “The tragic loss of Jordan touched the lives of every member of our athletic community. We have committed to doing everything in our power to make sure something like this never happens again, and that all of our student-athletes have a supportive environment,” Evans said in his letter. Maryland Gov. Larry Hogan said he would push for assurances that the issues outlined in the latest report are effectively addressed. “University leadership still faces the considerable challenge of restoring the trust of students, families, and faculty,” the Republican governor said in a statement. His rival in next week’s election, Democrat Ben Jealous, said that the university “has become a national embarrassment for putting the agenda of a few wealthy football boosters ahead of the health and safety of its student athletes,” and that both Durkin and Evans should have been fired. Baker cited the partnership he built with Loh that he said helped both the county and the university. “Throughout this situation, Dr. Loh displayed a level of candor and courage that are a testament to his character. I applaud him accepting moral and legal responsibility for Jordan McNair’s death. It was a sign of true leadership, guts and integrity,” Baker added. State Sen. Jim Rosapepe, a Democrat representing Maryland’s 21st District, commended Loh and said he should reconsider his decision to retire. WTOP’s Teta Alim, Kate Ryan, John Domen and Neal Augenstein contributed to this report.